New Boston freshman Grady Jackson guards Eastern senior Evan Leist during Friday night’s game at Glenwood High School. NEW BOSTON – It just wasn’t the New Boston Tigers night. That fact, mixed with the fact that they ran into the buzzsaw that is the 2018-19 SOC I champion Eastern Eagles, resulted in a home loss for the Tigers, 60-52. It wasn’t for a lack of effort from the Adam Cox led Tigers, they just happened to play one of the state’s best teams on a night when things didn’t fall their way, a credit to the strength and depth of the #10 Eagles team. That main thing Eastern did an excellent job of taking away? Getting defensive rebounds and get the ball out in transition to freshman guards Jerome McKinley and Grady Jackson, as well as junior Marcus Saunders. 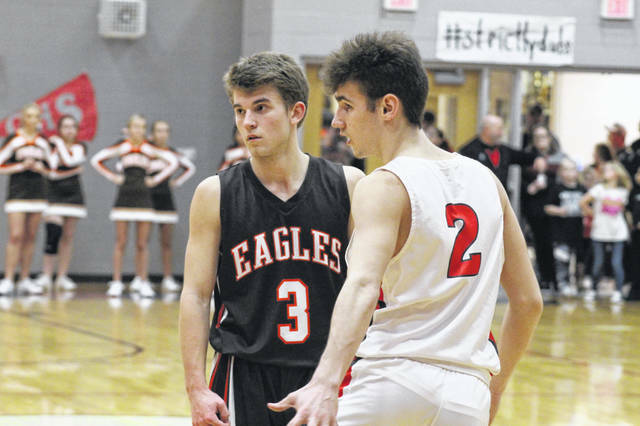 When the Tigers were limited by the Eagles size and strength on the offensive glass, that limitation made their life harder in the half court. New Boston was led in scoring by senior Tyler Caldwell who finished with a game high 17 points. Eastern was led in scoring by Cody Weaver who also finished with 17 to lead the Eagles. This game will not be one that Cox nor the Tigers will be able to dwell on for long. Next week, New Boston has two road trips prior to the first week of sectionals against Western on Tuesday and Notre Dame on Friday that will help determine their final place in the conference race and will be more measuring stick games going into the first week of tournament play.